From Bon Appetit’s Food Lover’s Cleanse come a few recipes worthy of our permanent file. Loaded with vegetables, including my previously avoided rooter – the parsnip – and zapped to perfection with a kick of complex chili flavor, we should eat white bean chili all winter long. 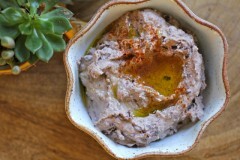 If you can get past the color, using black beans for hummus gives you a nutritional edge over garbanzos. I welcome the variety of and flexibility of using what’s in the pantry.